The Studio Gang Yonge + St. Clair project is the latest high-profile commission by Slate Asset Management in that Toronto neighborhood. Jeanne Gang is designing her first project in Canada, a mixed-use tower, and will become a fellow of the Royal Architectural Institute of Canada in May. Seen here: a mural by artist Phlegm near the Studio Gang site. (Via blogTO). The client is Slate Asset Management, which owns ten properties in the neighborhood and is working to rejuvenate it with public art, vibrant streetscapes, and first-rate design. Slate and Gang’s office, Studio Gang, announced this month that the residential tower will be at the southwest corner of Yonge Street and Delisle Avenue. 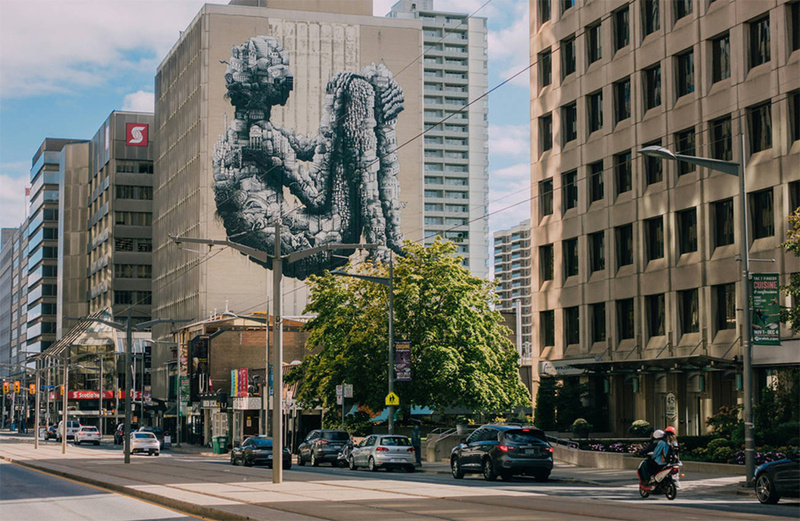 The project is the latest in a series of high-profile commissions by Slate, including an eight-story mural by international street artist Phlegm. The tower will be Studio Gang’s first building in Canada, and it’s part an effort by Slate to reimagine Yonge + St. Clair. Known for her Aqua Tower in Chicago, one of the world’s tallest buildings by a woman-led design team, Gang received a MacArthur Foundation “genius” award in 2011. She has been named to receive an honorary fellowship from the Royal Architectural Institute of Canada in May. The ceremony will be part of the Institute’s Festival of Architecture in Ottawa from May 24 to 27, and Gang will give the festival’s keynote address. “Yonge + St. Clair is on its way back. Having occasion to bring Studio Gang’s first project in Toronto to the neighborhood signals to the rest of the city that we would like to create something special here,” said Brandon Donnelly, Vice President of Development at Slate Asset Management, in a statement. “As our practice’s relationship with Canada grows, we’re excited to explore Toronto and to understand the unique DNA of the Yonge + St. Clair neighborhood,” said Gang. “We hope to design a building that will strengthen relationships within the neighborhood and the city.”According to the development team’s announcement, Studio Gang will work with Slate to organize a “public consultation” this spring to gather community input before making a design submission to the city. According to the developers, the final building will be primarily rental, with retail space at grade, in keeping with Slate’s long-term vision for the area. While the design for the building has not been finalized, Donnelly said, a couple of decisions have already been made.“It’s not going to be a typical all-glass tower,” he said, citing a need to introduce material variety into Toronto’s skyline. “We want to push boundaries in terms of sustainability and building efficiency, which means we are thinking carefully about the building envelope and its materials.” The Studio Gang commission will be the first ground-up tower in the area by Slate, which controls all four corners of the intersection of Yonge and St. Clair.The decision to commission Studio Gang was made after a selection process that emphasized design methodology, site context, and Slate’s aspirations for world-class architecture and a fresh vision. Yonge + St. Clair is a transit-rich area with a subway and dedicated streetcar tracks, but it is also a short walk from some of the city’s most admired neighborhoods and a ravine system that offers direct access to quiet green space. The juxtaposition of natural and built environments is expected to serve as inspiration for the project.